Please click here or on the image below for the auction catalog and additional images, or register to bid. 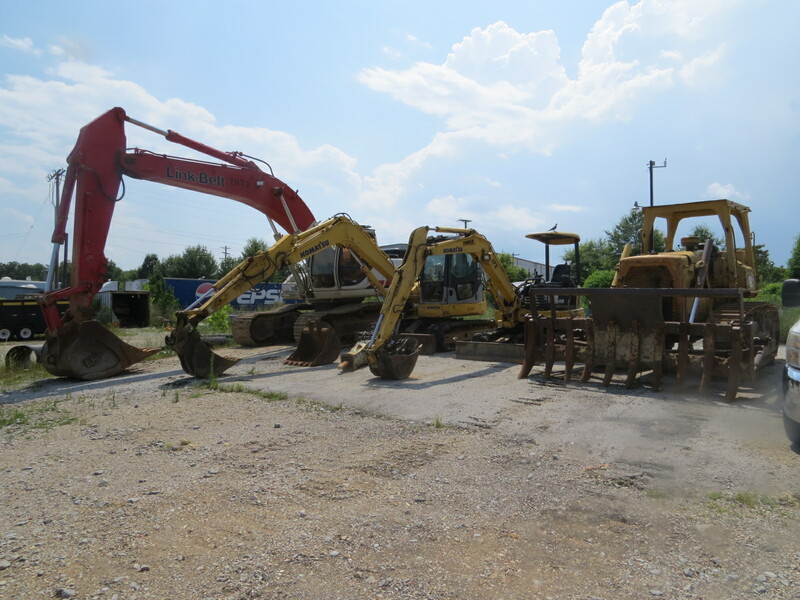 Excavators, dozers, backhoes, trucks and other equipment will be selling at auction Aug. 30 as Chattanooga’s Stein Construction Co. prepares to close its doors after 105 years. “The inventory includes heavy-duty pickups, flatbed trucks, water trucks, dump trucks and all types of earth-moving equipment. There will also be many smaller items, such lathes, grinders, drills and hand tools from DeWalt and other brands,” said Holt. The live auction will begin at 10 a.m. Wednesday, Aug. 30, at 3611 Amnicola Highway in Chattanooga. Stein said he and his partners will focus on real estate projects, such as the Black Creek development, which has become the largest residential development in Hamilton County. “The opportunity at Black Creek was ultimately more compelling to me than continuing to operate Stein Construction Co. in what has become a very different market,” said Stein. For more information or to register to bid click here. Stein Construction Company is going out of business after four generations of management by the Stein family over 105 years. Doug Stein said he is the last of his family involved in the business, and he will turn his attention to the development of the Black Creek and Aetna Mountain property in Lookout Valley. 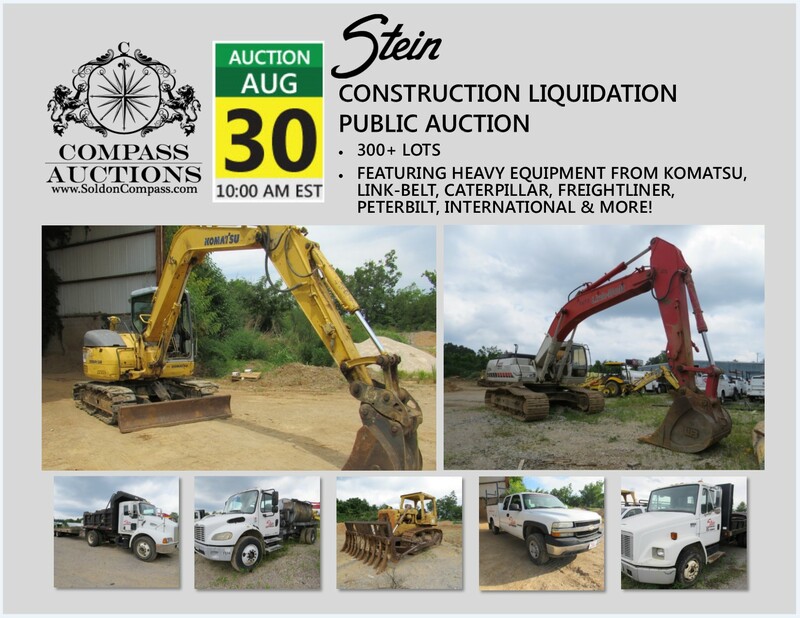 An auction of the Stein equipment will be held Aug. 30 conducted by Compass Auction at company headquarters at 3611 Amnicola Highway. Mr. Stein said that 6.7-acre property has already been transferred to PSL Holdings. He noted that he and two partners earlier acquired the huge Black Creek Development off Cummings Highway and Cummings Road. He said he and his partners have now bought out a hedge fund that was involved for several years. Mr. Stein said the group plans to develop one more small section above a recently developed area by the old Aetna Mountain Road. He said the area on the side of the mountain above that will be donated to land trusts. Mr. Stein said work began last week on paving another section of Aetna Mountain Road. He said it will eventually be paved to the top of the mountain. He said there are about 1,000 developable acres on top of the mountain, and he and his partners plan to be involved in its development. Stein Construction was founded in 1912 by John A. Stein, great-grandfather of Doug Stein. He was originally from Indiana, but took a job with a construction firm here. Gilbert Stein ran it from 1930 to 1950, building among other projects the intricate bridge on Cummings Highway at Jonas Bluff. J. Douglass Stein took over after Gilbert Stein suffered a stroke. Doug Stein joined the family business in 1980. He became president in 1989 after the death of J. Douglass Stein. His brother, Taylor Stein, became vice president. For more information about the auction including a catalog of items, photographs, registration and pre-bidding, click here.